Gardening should be a relaxing and pleasurable pastime, not a guilt trip. If you're new to gardening, losing plants can seem especially devastating. Adopting a guilt-free gardening philosophy can help you keep some perspective. 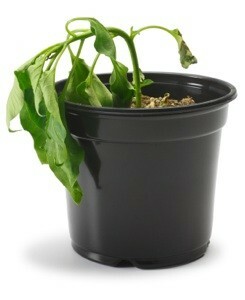 After all, a dead plant isn't the end of the world, it's just a dead plant. Yank it out, replace it, and move on. Sometimes plants appear to be dead, but are in fact just dormant. This is especially true in the spring, when many plants are painfully slow to emerge from a deep winter sleep. Before yanking anything out of the ground, it's always best to remove a bit of soil around the base and search for signs of life. If you see any greenery or swelling white buds on the roots, the plant isn't dead. It's just a late sleeper taking its sweet time to get growing. Poppies are a good example of a plant that seems to keel over "dead" immediately after they finish blooming. They're not really dead in mid-July, they're just taking a much deserved break. Don't give up on them just yet. Give them some time and their foliage may even green up again before fall. Take heart, beginning gardeners, even experienced gardeners lose plants. But like them, eventually you will have more successes than failures, too. Look at the death of one plant as both a learning experience and an opportunity to try something new. As any gardener with a well established garden will tell you, eventually the amount of space you have for plants diminishes, but the desire for more never does. Occasionally plants will die and you'll be grateful for the open space. With gardening, the best way to learn is by doing. Expect plants to die. Some will. And most likely, it will be your fault. Sometimes you will know what you did wrong, and other times it will forever remain a mystery. All you can do is try to identify the problem, learn a better way, and move on avoiding similar mistakes in the future. Thank goodness garden plants are basically inexpensive and easy to replace. Good points. I think it's important to look at the overall improvements you make. How much better the yard looks today versus last year, etc. Sometimes we get too caught up in each plant and forget the overall view.